When seniors need some extra assistance, in-home care is always a sensible solution. Professional caregivers provide a wide range of services, from grooming assistance to companionship. Here are a few indicators that suggest it’s time to think about in-home care for your senior loved one. A cluttered home is one of the first signs a senior needs extra help. When a home that was once meticulously cleaned starts to gather dust, it often means the senior in charge of cleaning can no longer do the work independently. Take note of any alterations in household maintenance. If dishes are piling up in the sink, the hamper is overflowing with dirty laundry, and the carpet looks like it hasn’t been vacuumed in weeks, it’s possible your loved one is no longer capable of performing these tasks. If the washing machine is in the basement, maybe he or she cannot bring the dirty clothes down the stairs. By stopping by a few times a week, an in-home caregiver can help your loved one maintain a clean household, which may boost his or her mental and emotional health. Huntsville, AL, home care professionals can be a wonderful boon to seniors. Whether they require around-the-clock supervision or just need assistance with exercise and household tasks a few days a week, seniors can enjoy a higher quality of life with the help of trusted in-home caregivers. Many seniors find getting in and out of the bathtub to be difficult, which can impact their personal grooming routine. If you notice your loved one has stopped shaving, doing his or her hair, or taking regular baths or showers, it’s time to provide some assistance. Home caregivers can provide expert grooming assistance. 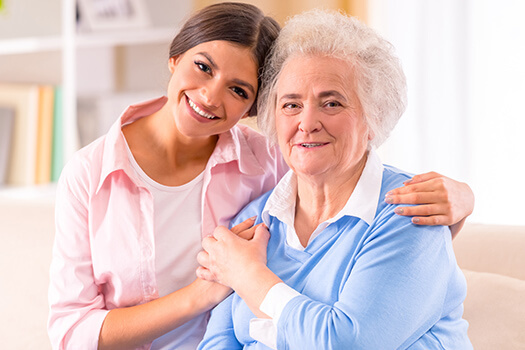 If your aging loved one needs occasional help with bathing, grooming, cooking, or other basic household tasks, or if you need time to attend to important personal matters, reach out to Home Care Assistance, a leading provider of live-in and respite care. Huntsville seniors can maintain their independence while living at home with the help of our reliable respite caregivers. As seniors age, they may have difficulty balancing their checkbook or making sure bills are paid on time. Seniors are often embarrassed by their failure to complete tasks that used to be simple. Because financial challenges aren’t always as obvious as a disordered house or poor grooming habits, you might not notice the issue right away. Keep your eyes open for stacks of unopened bills, as many seniors’ first impulse is to ignore the situation. Financial challenges are yet another sign seniors need organizational help. In-home caregivers can implement organizational systems that make things easier for seniors. Even if your loved one isn’t seriously injured, having an extra pair of hands around the house can make life easier. In-home caregivers can keep seniors safe, and they can also alert the hospital and family members if another accident occurs. It’s important for seniors to have regular contact with friends and family members. If they become too isolated, they’re more likely to experience depression and anxiety. In-home care can provide seniors with a steady dose of companionship. A caregiver can take your loved one shopping and keep him or her company during meals. In Huntsville, AL, home care agencies can be a great boon to seniors. With the help of the caregivers at Home Care Assistance, your aging loved one can lead a happier and healthier life. We offer a revolutionary program called the Balanced Care Method, which encourages seniors to eat nutritious foods, exercise and socialize regularly, and focus on other lifestyle factors that increase life expectancy. If you need a customized, high-quality care plan for your loved one, call us at (256) 716-9940 today.